Tra-la, what a day, only 50km, hardly a decent hill to be seen and lots of normal tourism activities! We are in Moravia, area of UNESCO recognised significance with castles, follies, churches, historical things of all kinds everywhere. We left the town of Breclav and wandered along little tracks and forest paths in the direction of Valtice. 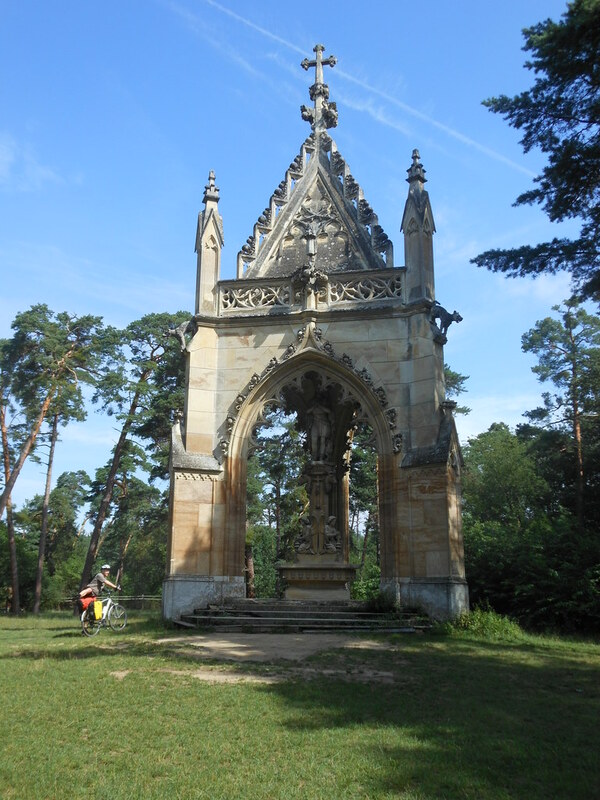 The first interesting sights for the day were 4 slightly lost Czech people in the forest (we gave them directions and they were impressed by our Garmin – they don’t know him like we do), followed by an ornate monument to St Hubert. The town of Valtice has a fine castle and other grand buildings. Lednice is not far away. It also has a castle accompanied by follies that were built all around by a wealthy family who liked that sort of thing. I liked the gargoyles here – dogs, sheep, cats, fish, all open-mouthed with agonised expressions ready to spout the water off the roof in a down-pour. 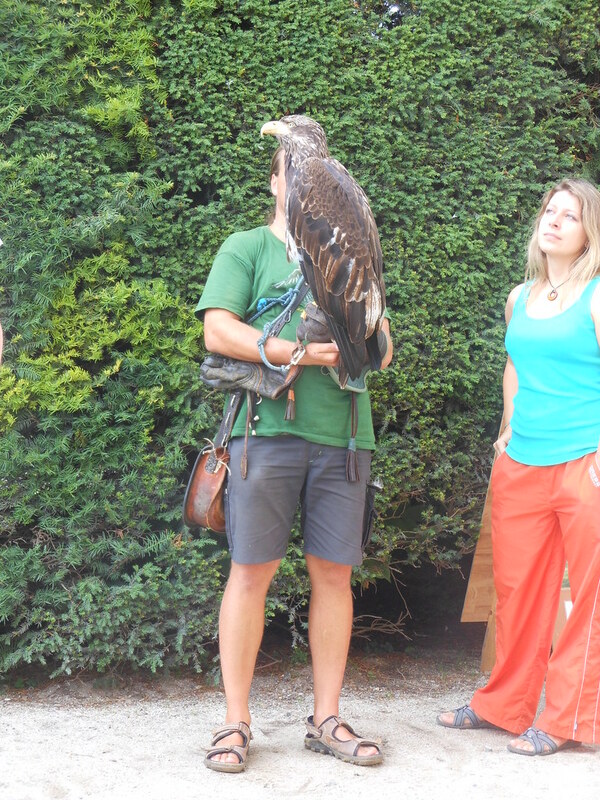 Tourists flock here in large numbers and there are many things to interest them besides buildings – for example birds of prey. 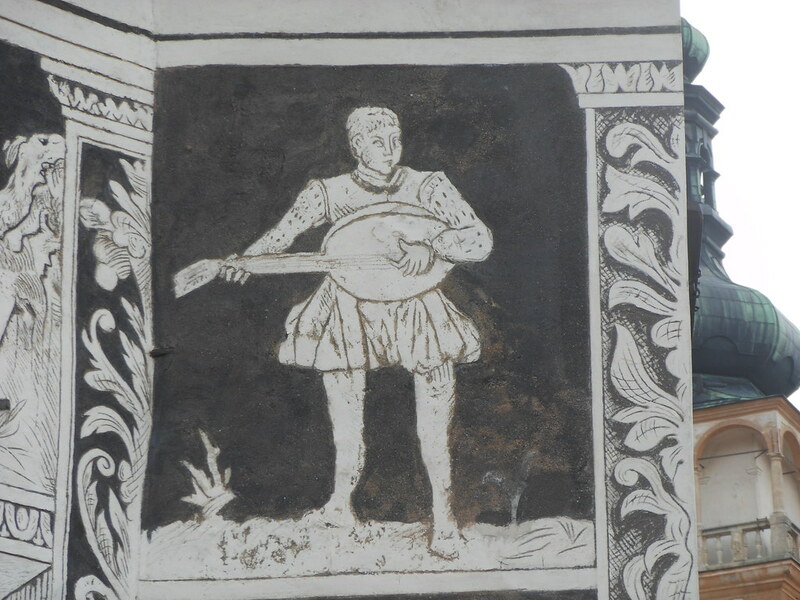 We saw three men, one with a huge eagle on his arm, the other two with a hooded falcon and an owl. After lunch of gulas with dumplings and palacinka (pancake) with apricot jam, we rode on through wheat fields and vineyards to Mikulov where a food and wine festival was in full swing in the main square. There were bands, beer, pigs on spits, bikes everywhere, amazing old towers and buildings all around (one decorated in the sgrafitto style including a medieval ukulele player), and a dramatic steep hill behind with the church of St Sebastian at the top. We walked around proudly wearing our Udiča t-shirts. We have now found out the proper way to order two beers, assisted by a Czech woman sitting at our table. Our non-Czech-ness is so easily discovered when we try to speak. Probably the Slovakian accent we have picked up. By the way, the frequency of punctures has really dropped off. Probably because the last one that occurred, just outside Puchov, was mended by a roadside crucifix. Breclav – Mikulov by ianwroberts at Garmin Connect – Details. This entry was posted on 21 July 2012 at 7:55 pm and is filed under Czech Republic. You can follow any responses to this entry through the RSS 2.0 feed. You can leave a response, or trackback from your own site. Sounds like you got a very nice day, and without rain! Actually Herman there was a late afternoon downpour, but we remained dry under a cafe umbrella!